Noam Chomsky, What Kind of Creatures Are We? (2016). Contrary to the biblical Gospel of John (1.1), in the beginning was not the Word. More important, in the beginning was not the sentence (or even the poet’s line). One obvious preliminary question here is, What do you mean by “beginning”? Well, let’s say, as global historian Yuval Harari does in Sapiens: A Brief History of Humankind (2014), that one plausible candidate for “beginning” is 200,000 years ago when Homo sapiens evolved, and eventually spread from Africa throughout the world. 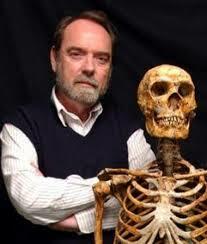 It was in the course of that dispersion that all other species of humans (such as Neanderthals) were wiped out. There are many other pre-linguistic beginnings that Harari (and others, such as paleoanthropologist Ian Tattersall) cite, in a timeline that ranges from the Big Bang (approximately 13 billion years in the past) to the formation of “life” on planet Earth (some 3.5 billion years ago) to relatively “recent” landmarks, such as the evolution of the genus Homo roughly 2.5 million years ago. But the beginning of Sapiens a mere couple of hundred thousand years ago will do for our purposes. 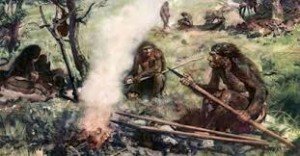 The point is, that for more than a hundred thousand years after that beginning, until what science writers now call the Cognitive Revolution – roughly, 70,000 years ago – there was, for tool-making, fire-using, small-animal-hunting, rather insignificant Sapiens, as far as communication is concerned, just a signal system, pointing, and some gestures, as was the case for other animals, especially apes and chimpanzees. By a signal system, we mean a set of a limited number of non-combinable signs that could be used externally for communication about potential food, enemies, or mates. What went on internally, in terms of “thought,” in the large-brained heads of Sapiens or the smaller-brained heads of chimps (or pick your favourite creature… dolphins, elephants, etc.) is pretty much obscure, apart from the very sophisticated guessing game known as evolutionary psychology. Yuval Harari, Sapiens: A Brief History of Humankind (2014). Michael Tomasello, Origins of Human Communication (2008). Clive Wynne, Do Animals Think? (2004). Justin Gregg, Are Dolphins Really Smart? (2013). Robin Dunbar, Grooming, Gossip and the Evolution of Language (1996). Charles Taylor, The Language Animal (2016). 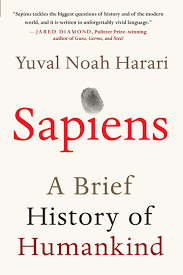 Harari remarks, early on in his best-selling, reader-friendly Sapiens, that “the appearance of new ways of thinking and communicating, between 70,000 and 30,000 years ago, constitutes the Cognitive Revolution. What caused it? We’re not sure.” Harari’s modest “we’re not sure,” which he repeats with respect to various other knotty issues, ought to be underscored. When we talk about the origin of language, communication, and human nature, as well as what distinguishes humans from other animals, a considerable degree of modesty about our limited understanding is warranted. He begins demurely: “The general question I would like to address in this book is an ancient one… I am not deluded enough to think I can provide a satisfactory answer, but it seems reasonable to believe that in some domains at least, particularly with regard to our cognitive nature, there are insights of some interest and significance… ” I’m not at all sure that Chomsky satisfactorily answers his eponymous, folksy question, but as almost always with the questions Chomsky asks, the project seems promising. Before we get to what’s so specially empowering about language, it should be noted that Chomsky deserves a good deal of credit for that “most commonly believed theory” about genetic mutations in human brains. More than a half-century ago, Chomsky reoriented linguistics toward biolinguistics, taking the view that the ability to acquire language as well as the underlying structure of language are biologically determined in the human mind and thus genetically transmitted. So, all humans share a capacity to acquire language, irrespective of sociocultural differences, even though those cultural differences will have a major impact on actual language acquisition and use. At the time, in the mid-20th century, Chomsky was concerned with refuting behaviourist psychology that regarded human minds as a sort of blank slate and thus treated language as purely learned behaviour. Clive Wynne, in his Do Animals Think? (2004), provides a useful and clear account of what’s so special about language. By the way, the short answer to Wynne’s title question is, Well, yes, sort of, but not very much, given that thinking is so dependent on language, and other animals don’t have language. Wynne emphasizes the set of rules or algorithms that we call grammar and apply to our vocabularies, both lexical (“ball,” “the,” “fire”) and referential (“The French Revolution,” “Noam Chomsky,” “Christina Aguilera”), in order to combine those items into new thoughts and sentences. “Grammar is the crucial lubricant,” says Wynne, “that opens language up from being limited by our vocabulary to being completely infinite in its expressive possibilities.” He adds, “Without grammar there is no language.” And maybe, without language, there isn’t much thinking. 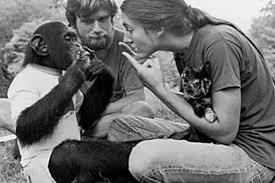 Wynne, a psychologist who is otherwise filled with wonder and delight at the capacities of non-human animals, provides a careful account of scientific efforts to teach other hominids language, including Herbert Terrace’s well-known experiments with a chimp he mischievously named Nim Chimpsky. Wynne notes that while humans are stringing together little sentences at age 2 or 3, “this never happened to Nim. The average length of his utterances remained stuck at only a little over one word.” Neither Nim nor any of the subsequent word and sign acquiring chimps of the 1980s and 90s ever demonstrated anything close to a minimal grasp of grammar. “And grammar,” argues Wynne, “is what makes the difference between being able to express a number of ideas equal to the number of words you know and being able to express any idea whatsoever.” Grammar is what turns vocabularies into open-ended systems, and without it, you don’t develop new sentences, new ideas, new thoughts. That’s why, in a sense, humans have rocketships and chimps don’t. Chomsky says something similar when he observes that “Darwin was not the first to conclude that ‘the lower animals differ from man solely in his almost infinitely larger power of associating together the most diversified sounds and ideas’… But Darwin was the first to have expressed this traditional concept within the framework of an incipient account of human evolution…” The rigid and limited signal system of most animals is contrasted to the exponentially gigantic vocabularies and flexible grammar of humans as a major marker of the unique kind of creatures we are. There are primatologists, such as Frans de Waal, who remind us of the importance of seeing the similarities and continuities between Sapiens and other primates (see Frans de Waal, “What I Learned from Tickling Apes,” New York Times, Apr. 8, 2016), but it’s the linguistic and cognitive gap that distinguishes us from our chimpanzee relatives. At this point, something odd happens in Chomsky’s discourse. Although the folksy register of his talk is maintained, the informal tone is no longer directed to a general audience of laypeople, but becomes an inside-baseball lecture (or, more properly, we should say, an inside-syntax lecture) aimed at an audience of linguists and other specialists. Even semi-professional readers, who have some familiarity with the topic, will find Chomsky’s exposition a slog. Chomsky doesn’t really elaborate on the notion of “Basic Property,” nor does he explain what “hierarchically structured expressions” exactly refer to, and it turns out that he has no interest, at least for the purpose of this talk, in discussing the “externalization” of language for communicative and other purposes. From this point on, Chomsky’s text, at least with respect to the “What is language?” question, is pretty much unreadable for non-specialist and semi-professional auditors and readers. From time to time, Chomsky returns to the comprehensible, always raising interesting questions. For instance, he reminds us of the early research program of linguist Otto Jespersen. For those perhaps frustrated by this particular book but interested in further exploring Chomsky’s ideas, fortunately, the famed linguist is also famously prolific, ever since he began with such early works as Syntactic Structures (1957) and Cartesian Linguistics (1965). What Kind of Creatures Are We? is just one of a dozen or more similar books, often brought to publication by Chomsky’s colleagues and admirers. This one has a longish if not especially helpful introduction by Akeel Bilgrami, a prominent Columbia U. philosophy professor, who hosted these lectures and is the editor of the series, “Themes in Philosophy,” in which this volume appears. Similar Chomsky books, focusing on language, range from On Nature and Language (2002), talks Chomsky gave at the University of Siena around the turn of the century, to The Science of Language (2012), Chomsky’s interviews with McGill University philosopher James McGilvray, to, most recently, Robert Berwick and Noam Chomsky, Why Only Us: Language and Evolution(2016). Most people, I suspect, will find the social issues more interesting than the technical linguistic questions addressed here, and find themselves, as I did, reading around Chomsky to get more of a picture of those small bands of early, fairly isolated, Sapiens sitting around campfires at night in what was otherwise a very dark, often unknown, world – a world without conversation for hundreds of generations. The notion of the gap between infinitely generative language and closed signal systems has been slow to take in the popular public imagination. The myth of other language-using animals persists. I recently read a thorough and well-judged examination of dolphin intelligence, Justin Gregg’s Are Dolphins Really Smart? (2013), which debunks the notion that dolphins are “speaking dolphinese.” Although dolphins are certainly relatively intelligent creatures that live complex social lives, it turns out that the myth of their human-like linguistic attributes was, somewhat innocently and amusingly, cooked up by biologists in the 1960s, principally by John Lilly. A lot of his epigoni (some of whom I knew) were very much of the age, and could fairly be described as stoned, hippie scientists. Most of Lilly’s speculations about dolphins turned out to be simply not true. Similarly, primatologist Robin Dunbar, in Grooming, Gossip and the Evolution of Language (1996) sees parallels between the grooming behaviour of monkeys and equally extensive human gossiping as crucial features in developing social solidarity that could support significantly enlarged human communities. It might have been helpful if Chomsky shared some of Harari’s sense of humour – although Chomsky does get off the acrid quip that at the rate we’re going, apes are more likely to acquire human rights than undocumented workers. His other lectures in this slim volume deal with the limits of human knowledge and the politics of the common good, and are comparatively much easier going. The limits of knowledge talk (which is supplemented by a similar, but extended essay at the end) usefully examines philosophic and scientific considerations, particularly in the 16th-18th centuries, of whether some topics are not just “problems,” but “mysteries” beyond the human capacity to shape into “admissible hypotheses.” One perspective that Chomsky offers that isn’t sufficiently thought about in much contemporary philosophy is the degree to which much of what goes on in human beings — from digestion to immune systems to minds — occurs outside of human consciousness. Chomsky’s willingness to consider the unconscious is one of the features that sharpens the focus of his chapter on the limits of knowledge. 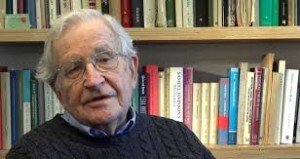 Since we are not only individuals who think and use language, but social animals who are by definition faced with the question, How should we live together?, it makes sense for Chomsky to address the issue of the common good. His political critiques, especially of American imperialism, are probably as well if not better known to the broad public than his linguistic ideas. 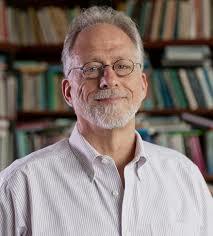 Here, he delivers a sort of standard, stump speech that offers a defense of his own beliefs in anarcho-syndicalism, libertarian socialism, and philosophic anarchism, relying on the obscure 1930s anarchist theorist Rudolf Rocker, as well as the ideas of the liberal democrat philosopher John Dewey. 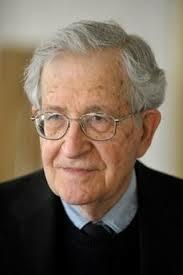 Chomsky provides a far more comprehensive exposition of his political analysis in his recent Who Rules The World? (2016).